Toddlers are inquisitive by nature; most parents know this. Yet, we often fail to see the potential hazards that simple objects can pose for our children. 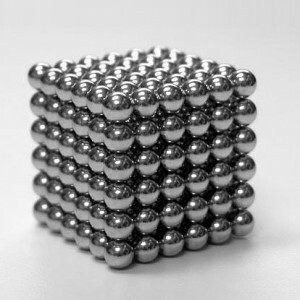 Such was the case in which a three-year-old recently swallowed 37 magnet balls and miraculously survived to tell about it. Little Payton Bushnell’s parents first chocked her illness up to having the flu, but as her condition worsened, they became concerned. Finally, they took her to the Randall Children’s Hospital emergency room to have her examined. Doctors performed a series of tests on Payton, but there didn’t seem to be anything wrong. Finally, in a decision that saved her life, the attending physician decided to perform an X-ray on little Payton’s stomach. It appeared that Payton had swallowed a bracelet, but as they went in to remove the item, they found out some disturbing news. What Payton had swallowed was much more dangerous, and it had gotten there, one tiny piece at a time. “The surgeon came in and said ‘I wouldn’t do this unless I absolutely have to but I have to cut your daughter open,’” said Payton’s father, Aaron Bushnell. 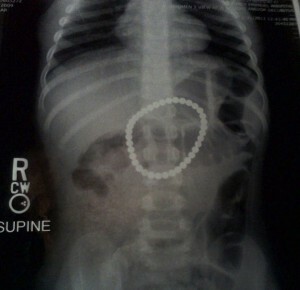 It turned out that Payton had swallowed 37 high-powered magnet balls, otherwise known as “Buckyball” magnets. When Sandy Nipper, a Registered Nurse from Randall Children’s Hospital at Legacy Emanuel’s Safety Store, learned about Payton’s situation, she became extremely concerned. Nipper went on to explain that, once the magnets started moving into the small intestine, they would cause the intestinal tract to snap together. Payton already had torn three holes in her lower intestines and one in her stomach. Thankfully, doctors were able to remove the magnets before they did any further damage. Payton is recovering well, but the road to recovery has been tough on her parents. “When they roll your daughter out with tubes sticking out of her, you don’t know how strong you are until all you can be is strong,” Aaron said. To help other parents avoid situations like Payton’s, Aaron and Kelli are speaking out. “If we had any idea what those magnets could have done to our daughter’s intestines, I would have never had them in our house,” Kelli said. Twenty-two cases of children swallowing magnets have occurred since 2009, and parents are being cautioned on the dangers. And the risk is not limited to magnet balls. Any magnet, including those found on refrigerator magnets and children’s toys, can pose a health risk if swallowed.